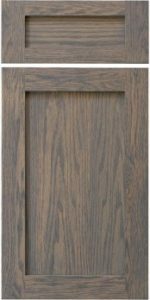 The TW-1038 is a plywood panel door that uses 3/8″ thick plywood versus the 1/4″ plywood found on a TW-10. The look is the exact same: a classic, timeless appeal of a simple design styling with no frills. As with the TW-10, the panel steps back 3/8″ from the face, but, some customers expressed interest in a plywood center panel that was thicker and more robust than the 1/4″ panel found on the TW-10. Conestoga delivered with this great price-point option. None - 3/8" veneered panel only. Yes - Apply over plywood panel.